All Key Stage 2 children learn how to play the recorder in Year 3. From there they continue to play a variety of instruments, including glockenspiels, keyboards, various percussion instruments and steel pans. We have a Key Stage 1 choir run on a lunchtime and Key Stage 2 children have the opportunity to sing in a choir on a Tuesday after school. In Year 6 there is an orchestra club on a Thursday lunchtime. Choir children in Key Stage 1 and 2 compete at Hornsea Music Festival in July and there are many more opportunities for children in music clubs to perform throughout the year, including a Christmas concert, our Year 6 Leavers Show and Hornsea Musical Extravaganza, a community music event held in June. The children in Key Stage 2 perform in class at the end of every lesson. 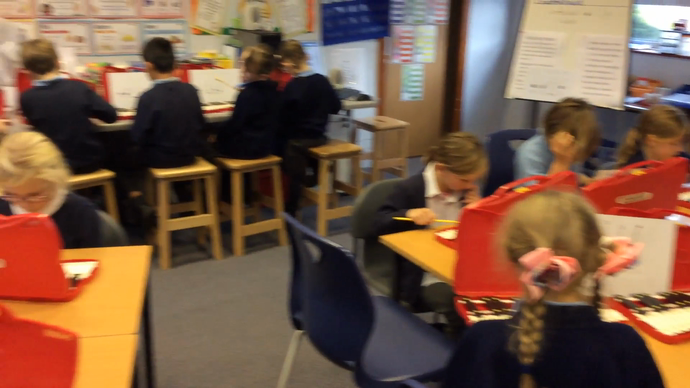 This is recorded on video and watched back so that the children can see and hear their progress. There are also sometimes opportunities for them to perform to other children in assemblies. Below are some videos of some of the children's performances, in class and assembly. The Year 6 classes have started the term with some excellent performances as 'rock bands' playing 'Livin on a Prayer' by Bon Jovi in parts on different instruments! Can you hear the melody of the chorus? We have had a very busy half term in Music! The Key Stage 1 and 2 choirs have performed at Hornsea Musical Extravaganza, Hornsea Music Festival and at a concert at the new bandstand in Hornsea. The Key Stage 1 choir won the trophy in their class at the Music Festival and the Key Stage 2 choir came second in their class. We were very proud of them all! Year 5 have been finishing their raps and Year 6 have been very busy practising for and performing in their leavers show. 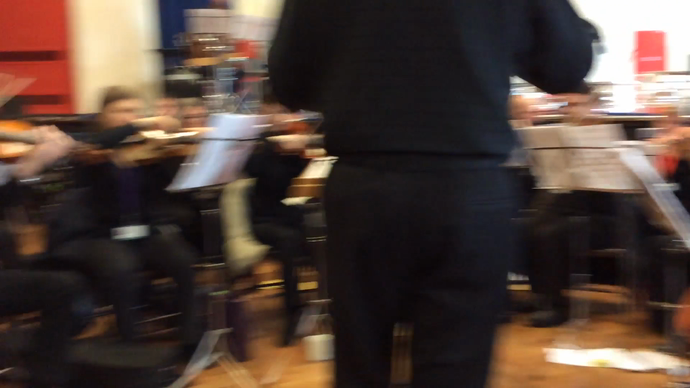 Year 6 sang beautifully and the Year 6 orchestra became a band and performed 'Teacher's Pet' from School of Rock! They all did a great job. 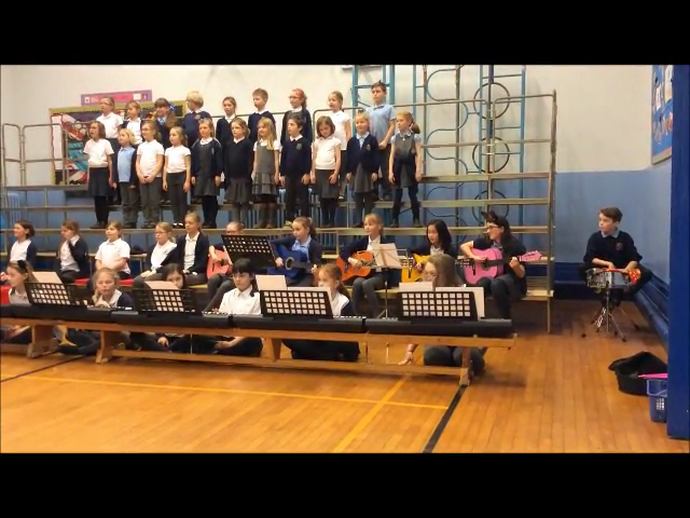 Year 3 and 4 have been singing and playing the R&B song 'Let Your Spirit Fly'. 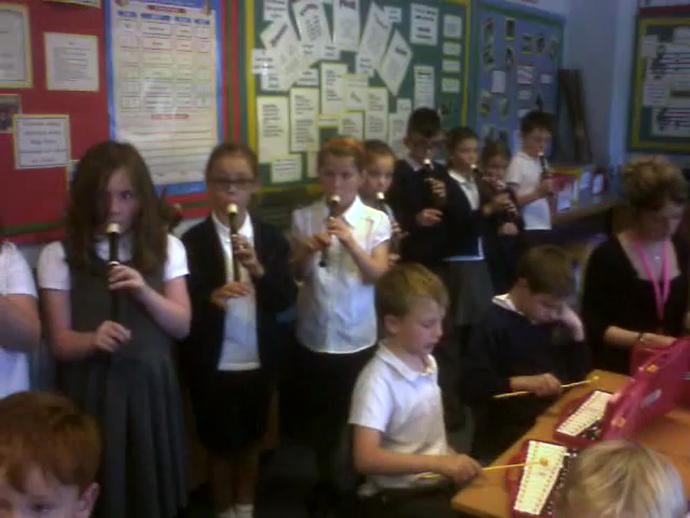 Year 4 played a slightly more complex recorder part and they all performed the piece really well. We now look forward to next year! Year 6 as always at this time of year are busy rehearsing their songs for the Year 6 leavers show at the end of term. To start our lessons, groups were given a set of two 4 beat notation cards to put in order. 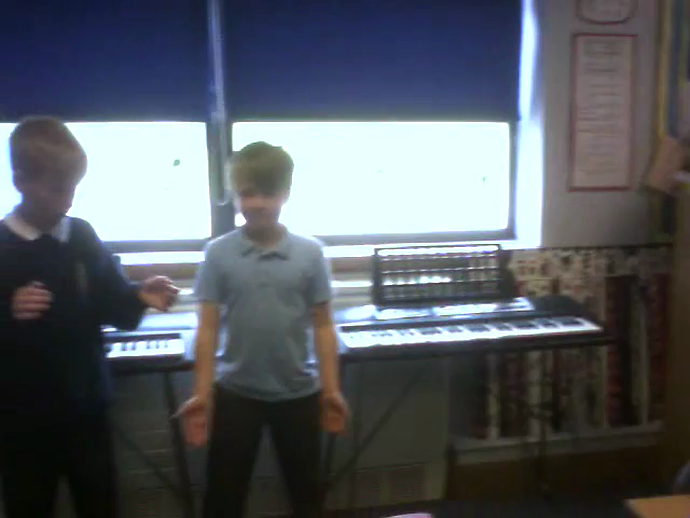 They then had to work out the rhythm and add some body percussion before playing it together. Following this they added an instruction to change the tempo and dynamics. Finally the groups swapped cards and tried to perform each other's rhythms. They learnt a lot about how to communicate ideas effectively in compositions! This class practised this piece again as a whole class with no backing track- adding guitars and a drum kit so they were a class band. They made great progress and really improved their performance from last time! This class did a brilliant job of playing this piece without a backing track, thanks to the fantastic drumming, confident keyboard playing of the melody and the added bonus of a guitar part. Those children made their own part using notes they knew on the guitars that fitted. The recorders and glockenspiels then played their parts in time with it well. Logan said afterwards, "I did get out of time once but I knew to stop and listen to get back in time again," which he did! This class have become so confident at playing, they don't even need the backing track to play the instrumental parts to this piece. Thanks to the amazing drummer they are able to keep in time and create their own piece of music together. They now just need to decide on a name for their rap group! Year 5 have learnt how to rap and play instruments to this famous song. This class did a really good job of playing three different parts on three different instruments together in time. This class have got great control of the notes B and A to be able to play this piece, following the notation on the board, after only their third recorder lesson. Well done 3AW! Just before half term Year 5 were lucky enough to be able to go to Hornsea School and Language College and watch the East Riding Schools' Music Service Orchestra perform their 'best of' the BBC Ten Pieces. There were many pieces the children enjoyed, including music from the Pirates of the Caribbean film. This class all composed 2 bars of repeating blues music using a choice of 5 notes with crotchets, minims, rests and trying to use some dotted notes to create a 'bluesy' rhythm. They recorded their compositions on a stave using standard notation. 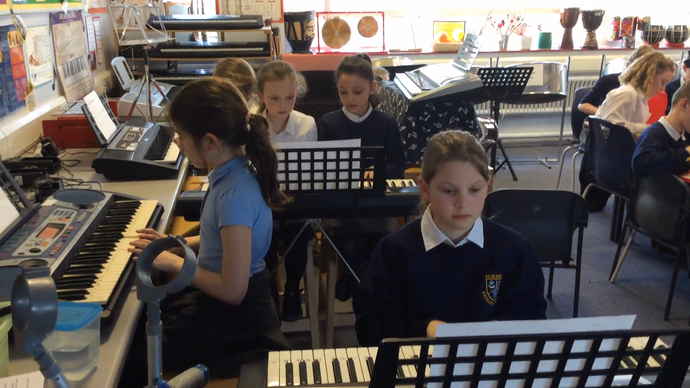 Three children from this class skilfully performed their compositions together. Year 5 and 6 have started to learn about jazz music this term. This class played the tune of this jazz piece together in ensemble really well. 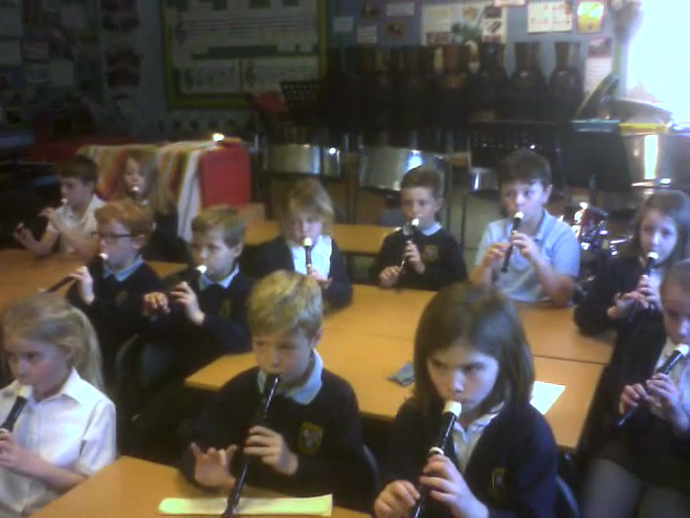 Well done 3LW for learning to play B along to a piece of music in your first recorder lesson! To start the new year with a bang, we decided to try and recreate part of the drumming sequence from the London 2012 Olympic opening ceremony! Year 5 and 6 had just finished their unit of work on samba rhythms and enjoyed the percussion instruments so much we found as many drums as we could to add to them and put these beats and rhythms together. Thank you very much to the East Riding Schools' Music Service Brass Band for a fantastic festive concert to Key Stage 2 during the last week of term! 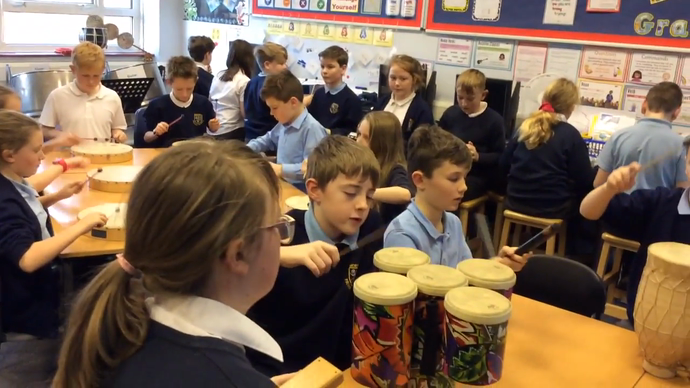 To back up their topic work on Brazil, Year 5 and 6 classes created polyrhythmic samba pieces by learning different rhythms on various samba percussion instruments and layering them together. They then composed their own call and response rhythms to break up the piece and put it in the structure of ternary form, using the samba whistle as a signal to change. These are the samba rhythms played by 5CW. This half term classes have moved on from performing to composing. This Year 3 class made repeating 4 beat tunes in pairs using crotchets, rests and the notes B,A and G. With so many different tunes being played together they did an amazing job of keeping together in time and performed brilliantly. 6SP 'Don't Stop Believin' Improved! This class did a great job of bringing their performance together and improving it since the previous lesson.They considered various musical dimensions in their playing and kept in time well with a drum kit added. It really improved the overall effect, creating a much more dynamic piece. 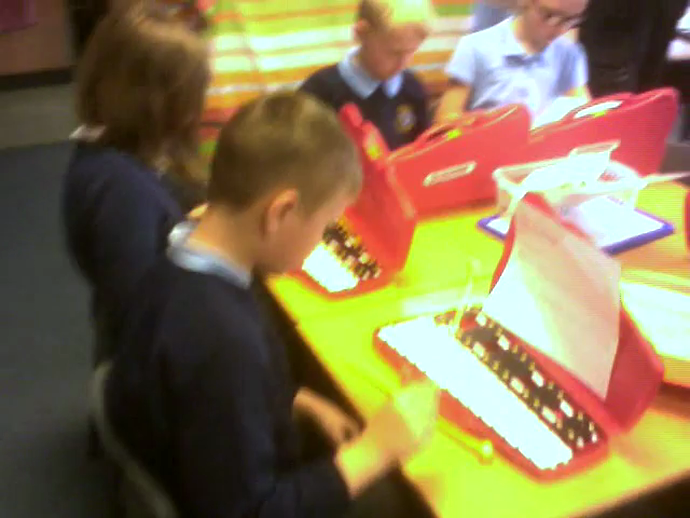 The Year 3 children in this class did a good job at keeping together on the glockenspiels, while the Year 4 children moved onto a different part. They played very well in time together at the end! 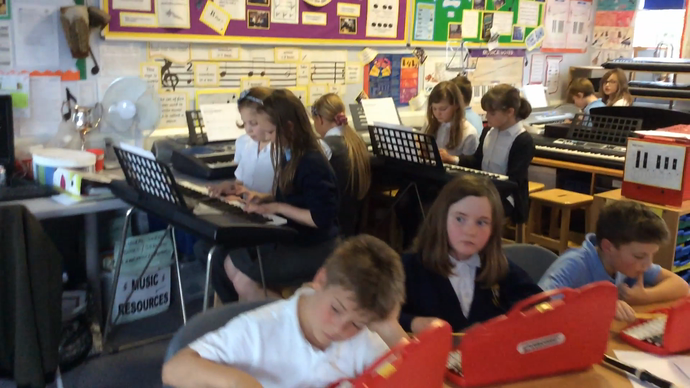 This class was lucky enough to have a pupil who had prepared some piano chords to accompany their instrumental parts. Therefore they could play as a whole band without the need for a backing track! They did really well at keeping in time together, with the help of the drum kit too. 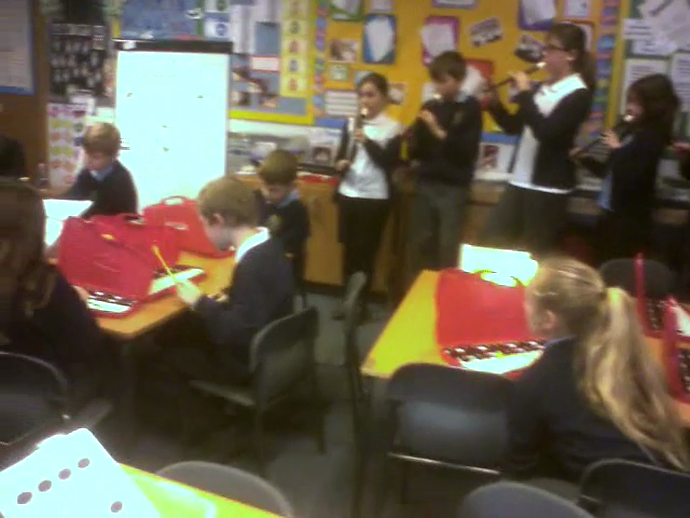 5CW 'Don't Stop Believin' Instruments Improved! WELL DONE TO THE KEY STAGE 2 CHOIR FOR WINNING THE TROPHY IN THE PRIMARY SCHOOL CHOIR CLASS AT HORNSEA MUSIC FESTIVAL FOR THE THIRD TIME!!! This half term we are very busy rehearsing for lots of upcoming shows and concerts. However there has still been some excellent performing in lessons, with Hornsea School and Language College students coming in to give a workshop to the Year 6 pupils as part of their transition process up to secondary school. Year 4 have also been learning to sing and play along to a song all about the Romans, which is their topic this half term. The guitar pupils did an excellent job of playing the chords to this One Direction song! This Year 5 group did a great job of composing a verse of the rap using all their ideas together then performed it very clearly so the lyrics could be heard- not easy when rapping as a large group! This half term Year 3 and 4 children have been learning to sing and play instrumental parts to the soul song 'Lean on Me' by Bill Withers. 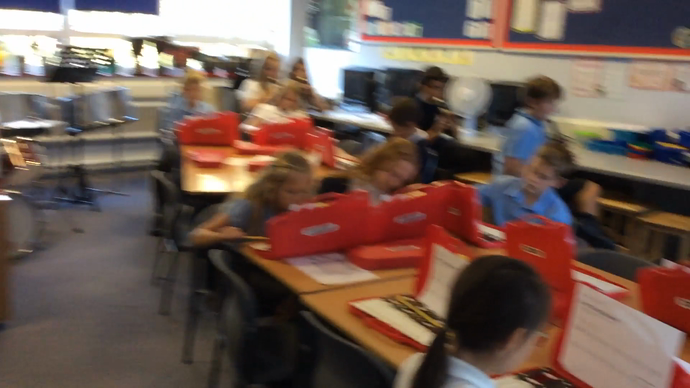 Year 4 played in at least 3 parts, on glockenspiels, recorders and keyboards. 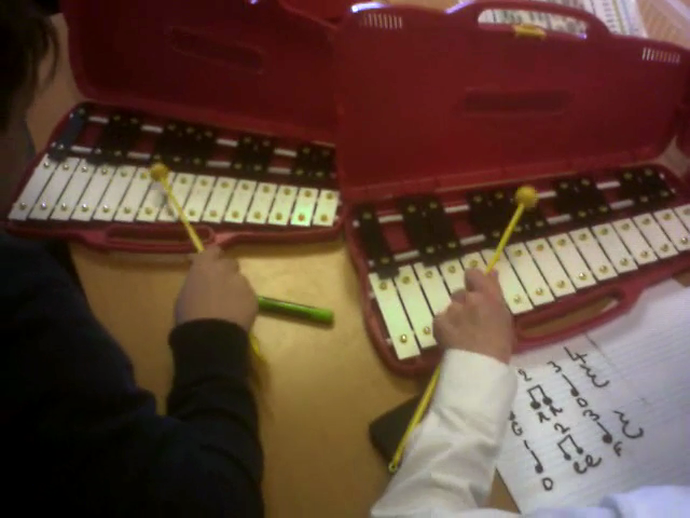 There were two different recorder parts and a very tricky extra melody part, which some children had a go at. Year 3 did a fantastic job at playing in two parts, on glockenspiels and recorders, with two different sets of notes to create a harmony. They also then composed their own tunes to the music. Some videos are below. Meanwhile Year 5 have been continuing to learn about rap and hip hop music, composing their own raps about stopping bullying, using rhyming couplets and assonance. They worked in groups to compose their own verses then worked together to create a class verse using some of their ideas, before performing it together. It was very difficult to fit all the words in as a whole class! A video and lyrics are below. This class composed a tune together using a combination of their different ideas. They tried to use notes they had already played on their instruments, but when a note was given that the recorders hadn't played before, Edie suggested that the recorders played a different note, one that they had learnt, at the same time. This created a very nice harmony we discovered! This half term Year 3 and 4 are singing and playing music linked to their topic 'Circle of Life'. 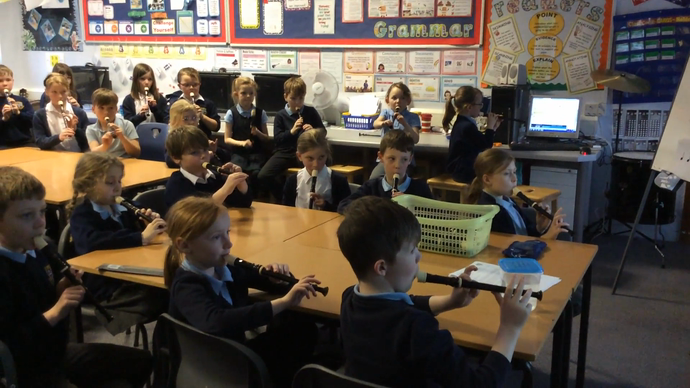 They have all sung the song from 'The Lion King', then Year 3 have been continuing to learn to play the recorder and Year 4 have been learning to play 'Old MacDonald' on different instruments. Year 5 are learning to rap, play instruments and compose to 'The Fresh Prince of Bel Air' and Year 6 are busy starting to prepare songs and music for their end of year leavers' show. Freya and Oscar did a fantastic job of performing their 2 bar composition in time to the 'Fresh Prince of Bel Air' backing music. They both said they like rap music which is lively and fast- we also listened to 'Rapper's Delight' by The Sugarhill Gang! This Year 3 class have improved so much this year! They have gone from playing small parts of this song on glockenspiels to learning how to play B,A and G on recorders and being able to play the whole chorus on the recorder! Well done 3JC! These children have been busy on Tuesday and Wednesday lunchtimes practising this piece for their leavers' show. It is coming along very well so far! This Year 5 group played their piece really well in 3 parts, including one child playing the very tricky melody on a keyboard. This group did extremely well to play some or all parts of 'Old MacDonald'. They listened well and challenged themselves, choosing parts appropriately, which resulted in them all playing together in time in a successful performance. This half term EYFS have been studying inventions in their topic work. As part of this they looked at musical inventions. 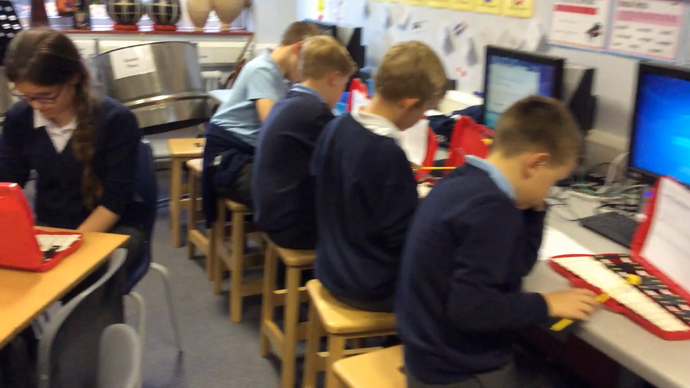 They used keyboards from the Music Room in their maths work to play a sequence of numbers between 1 and 12 that they had made up and written down. 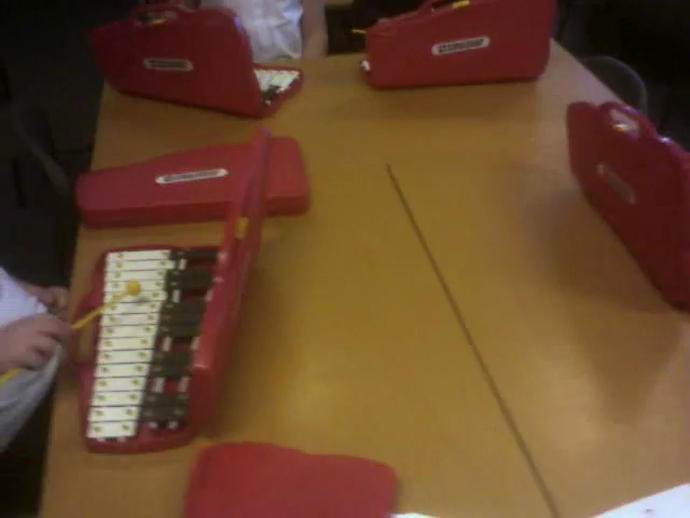 There were numbered keys on the keyboard so when the children played they realised they had actually composed a tune. They did really well at recording and playing their tunes! What a lovely morning we had! Year 5 and 6 are learning about jazz music this term. 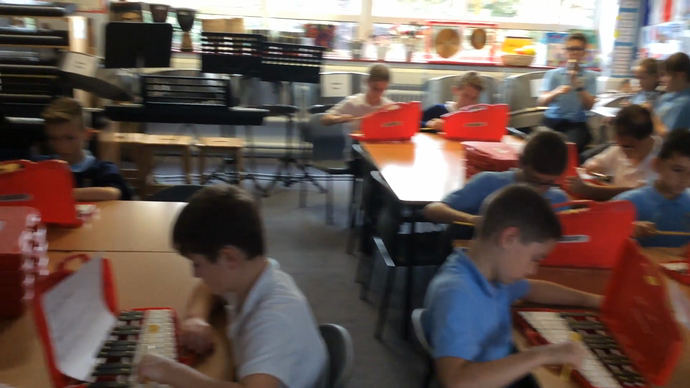 Year 6 have learnt to play a piece of music inspired by the music of Burt Bacharach. It comprises of three sections: a tune/head, middle 8 and improvisation section. The children needed to try and play it in a 'jazzy' style. This class did brilliantly at all three sections. This video shows them playing the tune/head on glockenspiels. Some children played part of the tune but most played the whole tune. 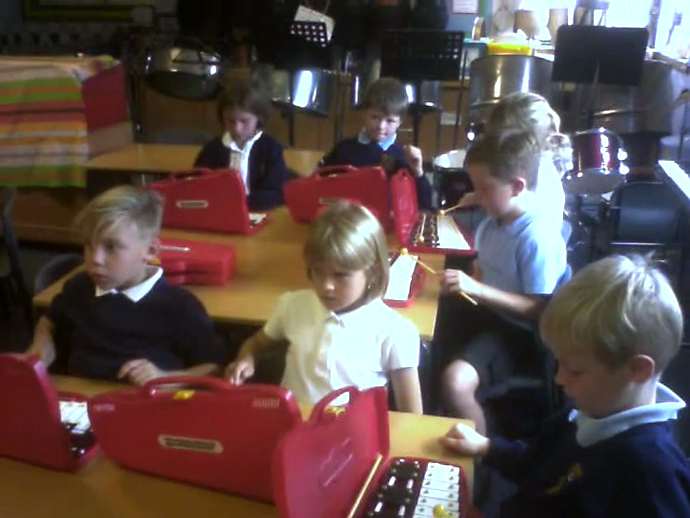 Year 4 children are starting to learn to read music through playing C and D on a glockenspiel. 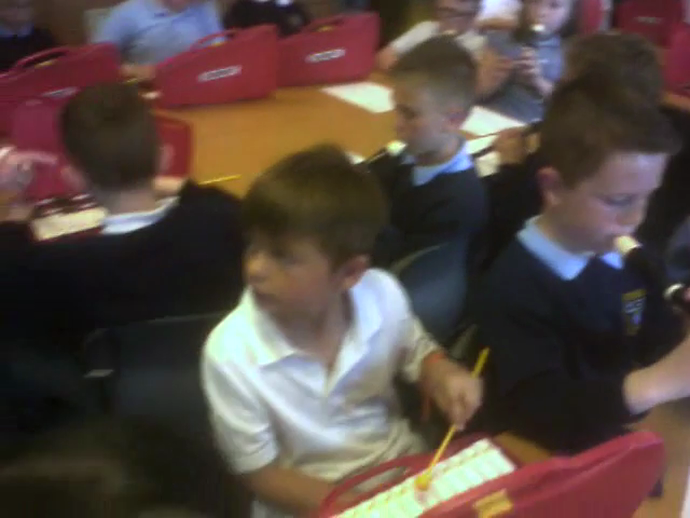 Some Year 4 children have learnt how play C and D on a recorder. 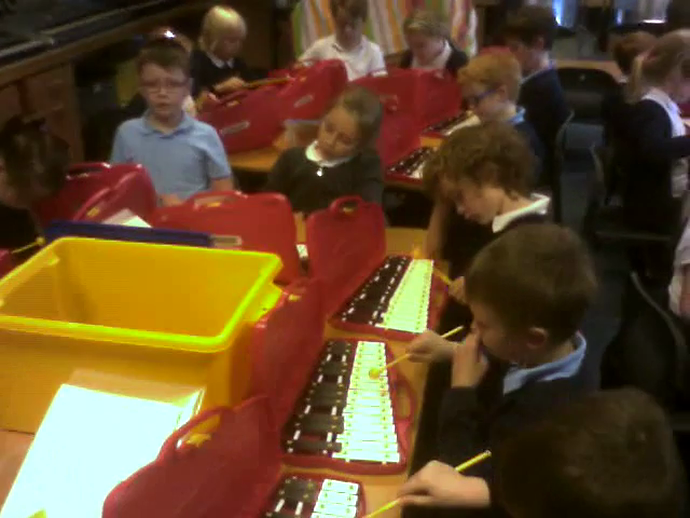 The Year 3 children joined in on the glockenspiel. They have all worked together to perform 'DeeCee's Blues'. The choir and orchestra have been very busy this term practising for their Christmas performances. They performed brilliantly at the Carols Around the Tree night and to Key Stage 2 at a special Christmas celebration assembly. The children have been busy composing their own tunes to their pieces of music this half term. 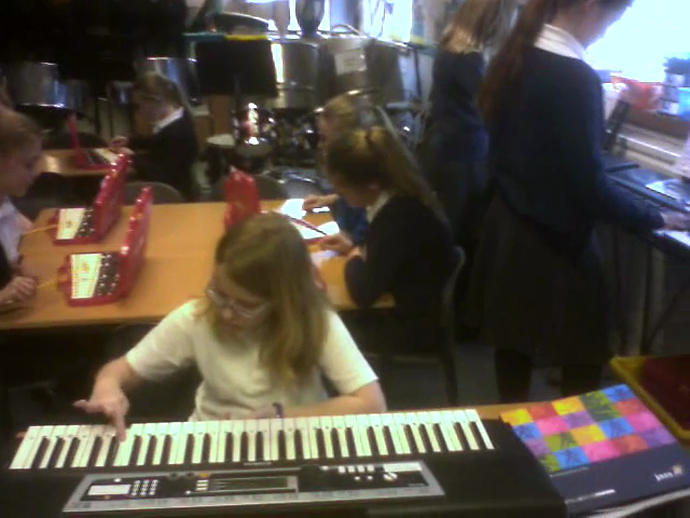 Here are 3AW and 3JC with their different compositions played together to 'Mamma Mia' using B,A,G and 4 crotchets. They had to concentrate hard to keep together in time. This half term Year 5 and 6 are singing, playing instruments, improvising and composing to the rock song 'Livin' On a Prayer' by Bon Jovi. Year 3 and 4 are working on 'Mamma Mia' by Abba. All groups have made a brilliant start to the term. 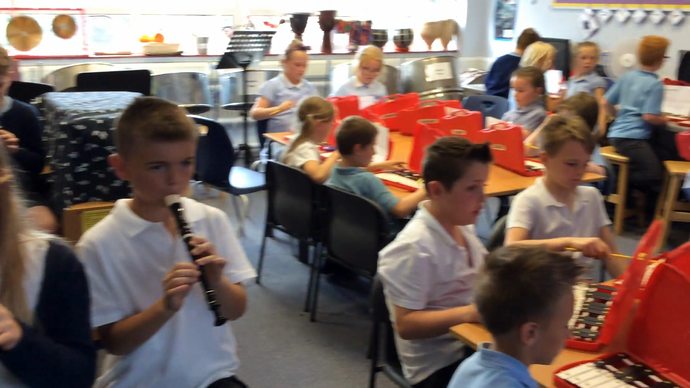 This Year 3 group really improved their performance from their last lesson (video further down). 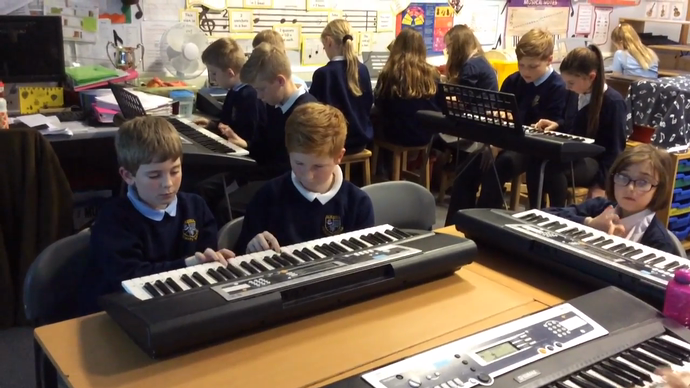 They played in two parts, choosing their own from what they had practised, and even added a third melody part on the keyboard- played brilliantly. They used a combination of listening, saying the notes to themselves and reading the notation. Well done! Mr Thompson brought his bass guitar in to Year 5 and 6 music lessons to demonstrate how it sounds in a rock song! This group were so good at clapping the rhythm of their names, they were given an additional task. This was to try and group together with other children with the same name rhythm. Some children had very individual name rhythms, while one group had lots of children with the same name rhythm! When they had decided where they should go, they clapped their rhythms together at the same time to make rhythm layers. Drew was very good at working out other peoples' name rhythms to help them to choose the correct group. 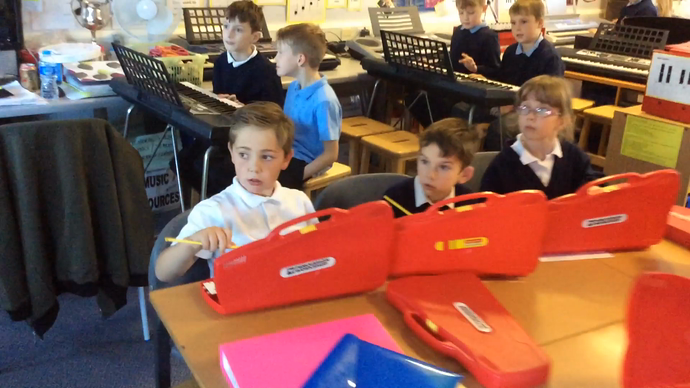 This Year 3 group showed how well they had remembered their glockenspiel skills from Year 2 in playing along to 'Mamma Mia' in two parts! They had to listen very carefully and count to keep in time with each other and the music. At the end of the summer term, a lot of children from our school joined in the carnival parade with our 'Pirates of the Caribbean' float. Our float won two prizes, including best overall float! Our Year 5 Steel Band contributed towards this by performing brilliantly for over an hour, on the float, while dressed as pirates! We have had a great time in Music this half term with lots of performances... Year 6 sang and performed their pieces brilliantly in their transition concert at the secondary school and at the leavers shows. All the music clubs performed to parents and the public in the Hornsea Musical Extravaganza. The Key Stage 2 Choir sang wonderfully and won their class at Hornsea Music Festival and we had great fun at the Big Brid Sing! We started the new term on a musical note, with the Year 6 orchestra performing Edvard Grieg's 'In the Hall of the Mountain King' to Key Stage 2 in assembly. They did a really good job and all the weeks of practice paid off! We look forward to performing it again during our concerts at the end of term. 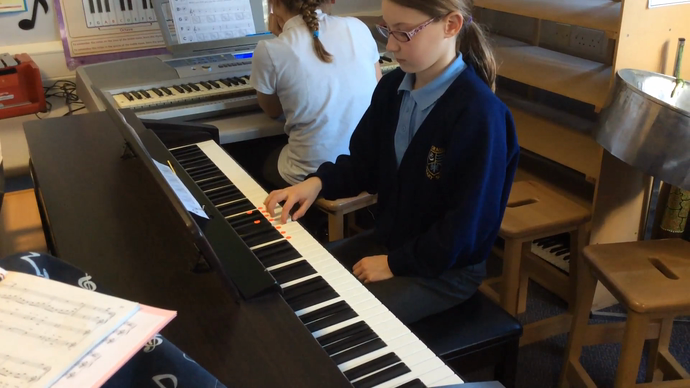 Year 6 have been learning to sing and play instruments to the song 'Make You Feel My Love' by Adele. 6NF did a particularly good job of playing their instrumental parts unaccompanied. 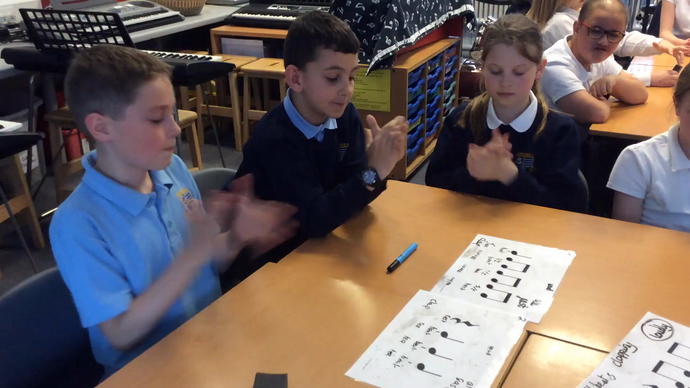 In Years 3, 4 and 5 this half term they started their lessons with a musical problem to solve... With a given set of rhythm notation cards per group, they had to work out the number of beats, duration of the notes and choose some body percussion to practise and perform their rhythms. They then had to adapt their music by changing the tempo or dynamics, or both. Once they had performed their own pieces, they had to swap cards with another group. That group had to follow the instructions they had put on their cards to play their rhythms using the correct body percussion, tempo and dynamics. The children reinforced a lot of their knowledge of musical notation through this activity, as well as working well together to create and perform their own pieces. The children also started work on some songs, which will be finished after half term. Mr Stubbs' Guitar Groups Performance! 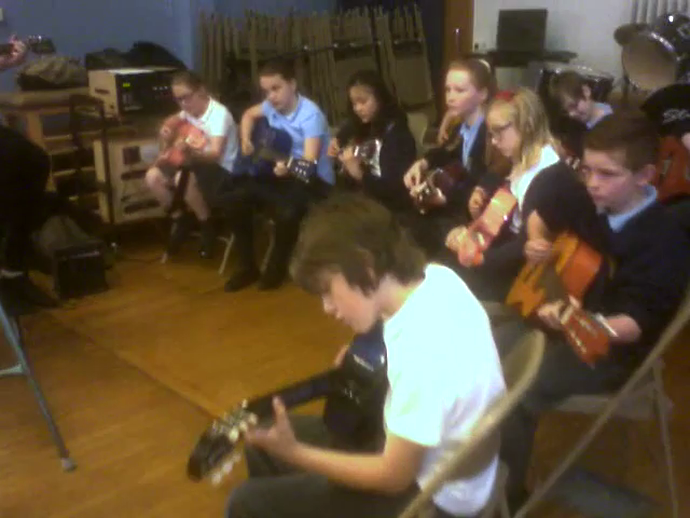 Mr Stubbs' guitar pupils gave a little performance of their work so far this year to Key Stage 2 in assembly. They performed 'Pack Up Your Troubles' and also an Easter song which they had composed between themselves. Everyone was very impressed by their skills! This half term the children have started to learn to sing different songs, to which they will be adding instrument parts. To begin each lesson, every year group was given a musical challenge: to work in groups to compose a short repeating tune using a given 4 beat rhythm and a set of notes from their previous piece of work. Each year group had a different rhythm and set of notes. They had to work together to figure out the notation for their rhythm. They could play either a recorder or glockenspiel. Each group then composed their own different tune. They rehearsed in groups and as a class and, because the rhythms were the same, when played together they created some nice harmonies. They had to internalise the pulse to keep in time and to try not to speed up! These two classes did this very well. Year 5's rhythm was 4 quavers and 2 crotchets, or "coffee, coffee, tea, tea", which is what we say to remember the rhythm! This class decided to build their performance a group at a time. The Year 6 rhythm was crotchet, 2 quavers, rest, crotchet or "tea, coffee, rest, coffee". This half term we have been very busy learning about jazz, swing and blues music! 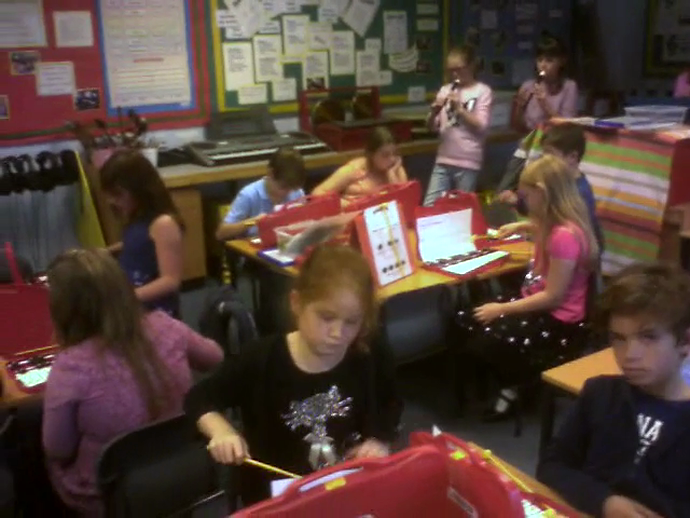 Year 3 have continued to learn how to play the recorder while Year 4 have been improving their skills on a glockenspiel. Year 3 children have learnt how to play B, A and G on a recorder. Some children have been practising at home and can play the piece 'Hot Cross Buns' with these notes. A few children have learnt even more notes at home, such as C and D! This class worked together to perform two pieces of music at the same time. 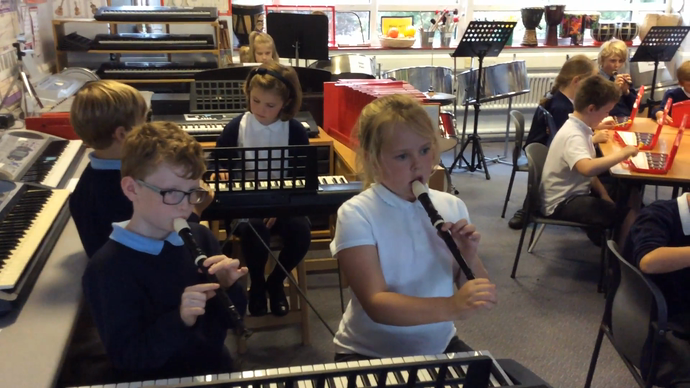 The Year 4 children, who could already play the recorder, helped the Year 3 children to play A and B so that they could perform the recorder piece 'Abie's Blues'. 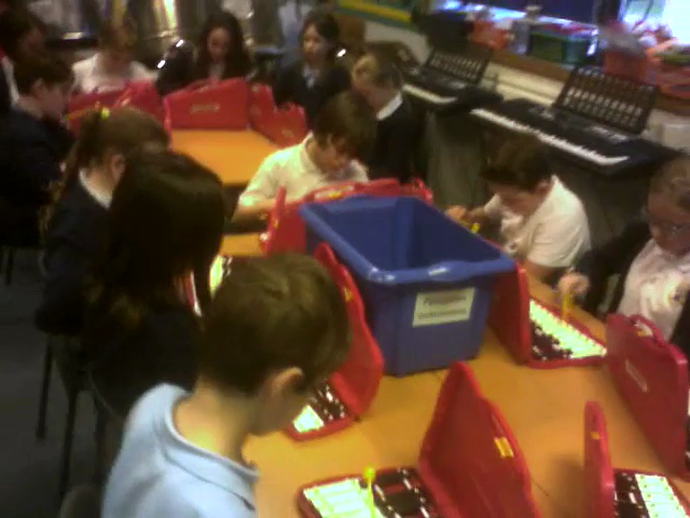 The Year 4 children then learnt the piece 'DeeCee's Blues using D and C on a glockenspiel. The two pieces fitted together using different notes played at the same time. We thought the different notes played together sounded quite 'bluesy'! Year 4 children are extending their musical knowledge through learning how to play more pieces on the glockenspiel using notation. This group performed a particularly tricky piece from notation using D,E and F on crotchets, minims, crotchet rests and minim rests. They listened to the piece first and then practised with the notation, using reading of the notes, counting and their listening skills to achieve a brilliant performance which they were really pleased with! 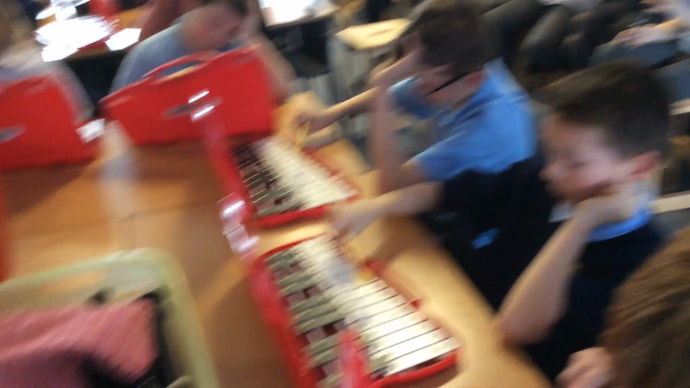 Once the Year 4 children had learnt how to play the piece 'Portsmouth', they quickly picked up 'D-E-F-initely' on their own using the same musical knowledge and listening skills. There was a new note added- a semibreve- and they had to read more of the notes on the stave independently. Year 5 children have been learning about Jazz and Swing music. They have played and improvised to this music using 3 then 5 notes (pentatonic scale). They are being challenged to use different instruments and to improvise individually in small groups. 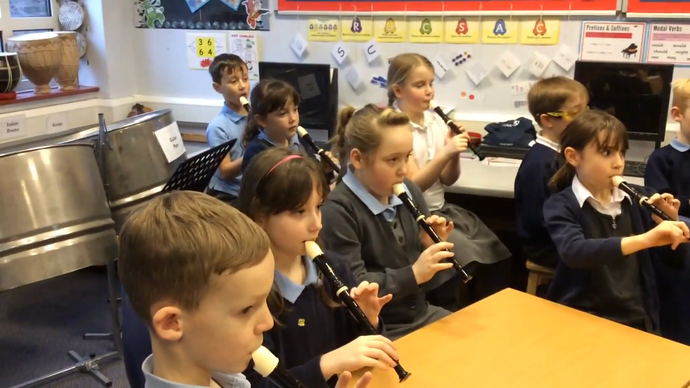 The children have stayed on the same type of instrument for both pieces of music and have developed their skills on those instruments as a result. Each instrument group improvised on their own in the middle of the pieces and the children had to remember to look at the structure of the piece in order to know when to come in on time. This was extended by adding a middle 8 section in the second piece of music. Year 6 have also been learning about Jazz and Blues music. 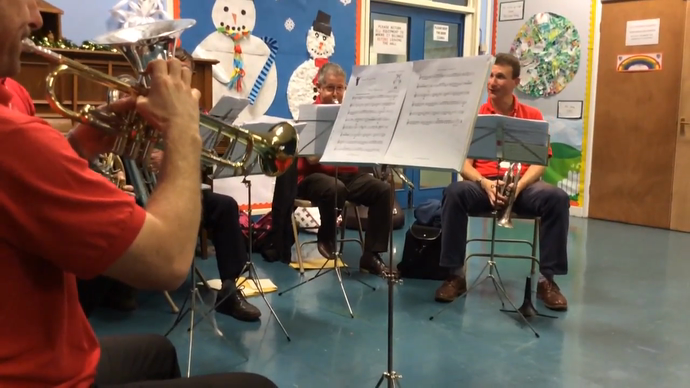 They started by learning to play a piece of music in the style of Burt Bacharach, using 5 notes, with a more complex tune, and using listening and reading the notation to play. This piece, 'Bacharach Anorak', also included a middle 8 section and an improvising section to develop their skills in playing these parts of the music. Following performing this piece, the children moved on to composing and performing their own tunes to 'Meet the Blues'. Their challenge was to try and use 5 notes, including Bb, a dotted rhythm if they could and write the notes on the stave. This half term the Year 6 Orchestra have been continuing the work that all Key Stage 2 started last term on the piece 'In The Hall Of The Mountain King'. They have looked at the structure of the full piece and have learnt parts on different instruments, following the notation to make a complete piece. After all the rehearsing we hope for there to be a performance, involving children from other year groups too if possible! Merry Christmas from the Year 6 Orchestra! The Year 6 Orchestra practised on a lunchtime and performed their piece, Jingle Bells, for Key Stage 2 in assembly. The choir have been practising on a Monday lunchtime. They started to learn the original version of 'Do They Know It's Christmas?' before the new version came out. They then learnt the new words and were asked to perform at the 'Carols Around the Tree' night. They performed the song again for Key Stage 2 in assembly. It was hard work to learn all the words but they did a great job! 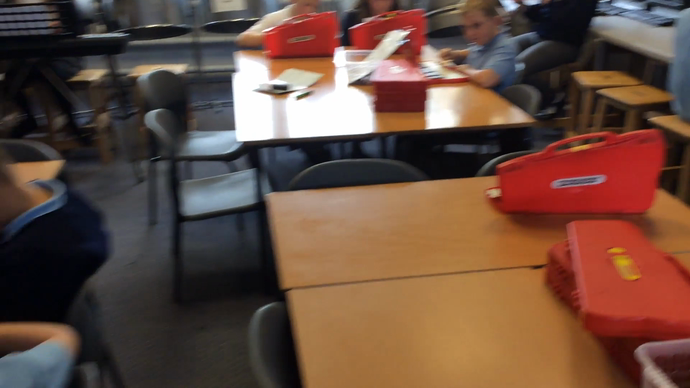 In Year 5 ICT lessons the children have been creating stop-motion animation based on 'The Nutcracker' story. In Music lessons we have played 'Dance Of The Sugar Plum Fairy' from The Nutcracker Suite by Tchaikovsky. Some children played the bass notes, others played a repeating ostinato pattern of notes and a few even tried the difficult melody. It was quite tricky to keep in time! One group has recorded their music to be the soundtrack to their animation. To mark the centenary of the Christmas truce during the First World War, some KS2 classes are learning the words to Silent Night in the original language in which it was written- German- 'Stille Nacht'. They practised singing the first verse of the carol in English and German at the same time, to remember what happened in the trenches on Christmas Eve before the truce, when the Germans and English were said to have sung carols together. This class practised singing the words to Silent Night in English and then German, before combining the two. They tried to capture the poignant mood of the carol as it could have been sung in the trenches by the two sides a hundred years ago. After singing the carol in two different languages, the children learnt how to play the music in two different parts, melody part and two note chord accompaniment part. They had to decide on how to get a balance of sound with their instruments through their choice of instrument sound on the keyboard and the dynamics that they played and sung at. In KS2 music lessons this half term we have been studying a piece of music from the BBC Ten Pieces initiative. The whole of KS2 watched the Ten Pieces film in two parts in assemblies. The film mixes live action from CBBC presenters and other celebrities with animation and classical music performances by a fantastic orchestra. In music lessons we have listened to and appraised one of the ten pieces, 'In The Hall Of The Mountain King' by Edvard Grieg, and then each year group has worked on instrumental parts to accompany it. We are hoping to create a performance together with children from every year group. There is a BBC Ten Pieces website with lots of ideas and activities for the children to do following on from the film. Year 5 children listened to and appraised the piece of music being played by an orchestra first. They learnt about the story behind the piece and tried to identify which instrument families were being played and how the music changed throughout the piece in terms of the dynamics, tempo, pitch and texture. They related this to the mood of the piece and how it reflected the story. The children then learnt about the importance of the conductor in keeping the instruments in time before having a go at playing along to the music in parts, in a staccato style, while trying to keep in time with the increasing tempo. It was quite challenging when the music was very slow and when the music was very fast! 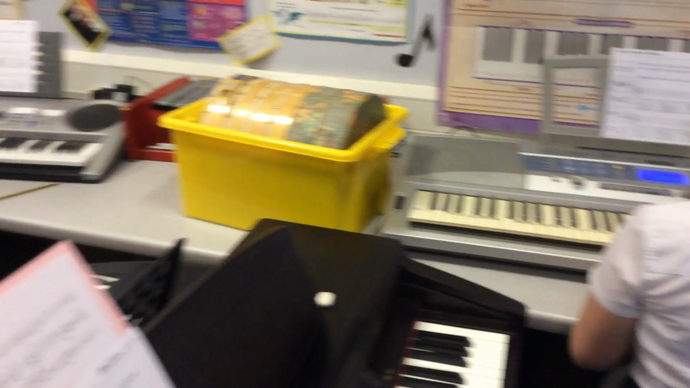 Year 6 also listened to and appraised the piece of music in the same way as Year 5. 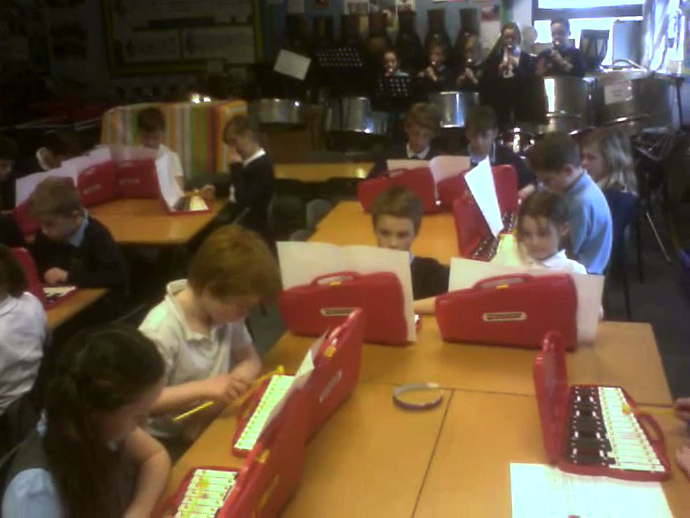 They then moved on to some different instruments and created a class orchestra using pizzicato strings on keyboards, glockenspiels, steel pans, recorders, piano and the bass drum and cymbal, which they saw being played in the piece by the orchestra. As two girls could play the piano melody part, the children could play as an orchestra together with no help from a backing track. They had to listen to each other, as well as focus on their part, and they did very well to keep in time together! 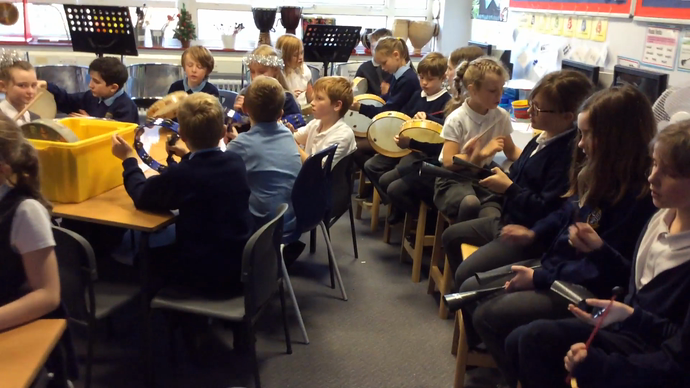 Year 1 and 2 have been having percussion lessons from the East Riding Schools' Music Service. They have been learning how to play African djembe drums. They have learnt how important it is to listen and keep in time together to make a good performance. In their lessons, Mr Pymm from the Schools' Music Service taught the children how to play a rainforest soundscape, using vocal sounds for the animals in the rainforest and drums for the thunder and rain. The children listened and performed really well and had a great time! In music lessons Year 3 and 4 have been learning to sing the song 'Three Little Birds' by Bob Marley. They have been learning about pulse and rhythm through playing lots of music games. They have played different instrument parts on glockenspiels and recorders. They have started to improvise and some have moved on to composing their own tunes! 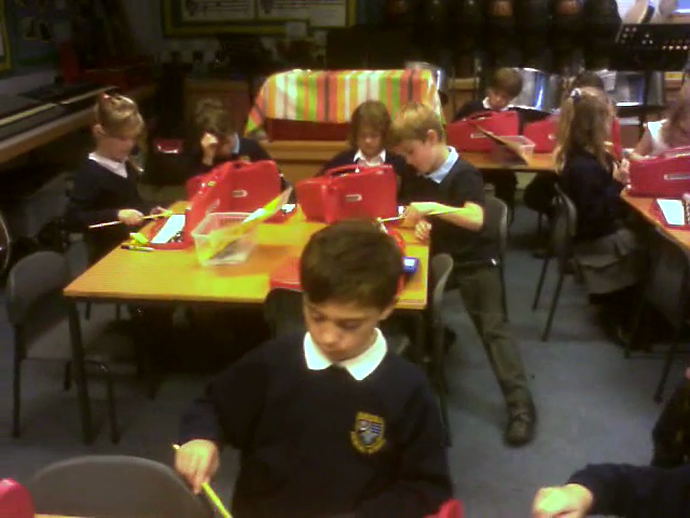 Year 3 have learnt how to play glockenspiels and keep in time to play their instruments together. 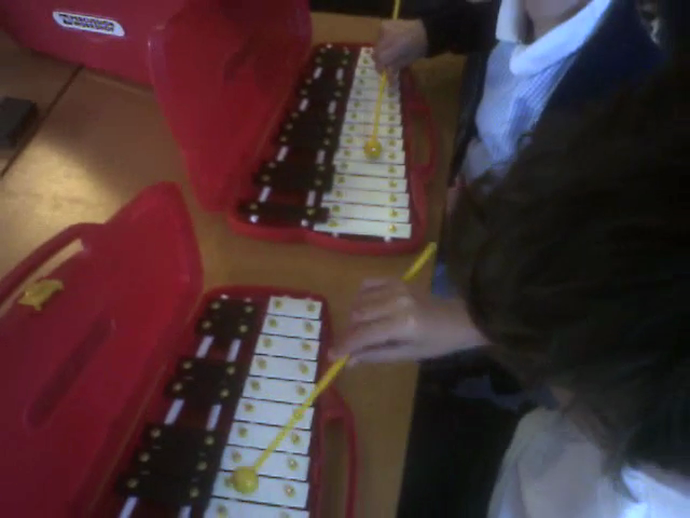 In groups, the Year 4 children composed their own 4 beat tunes using up to 4 notes to fit with 'Three Little Birds'. They used crotchets, quavers and crotchet rests. 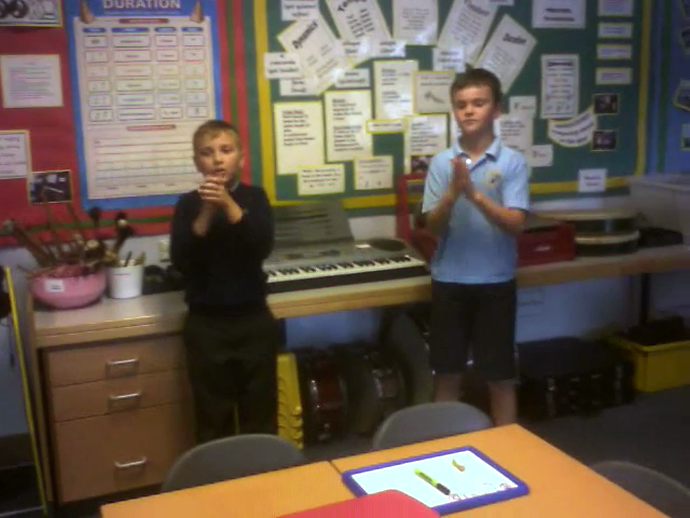 They practised and performed their different tunes together to create harmonies. They managed to keep in time together very well! Each group in this Year 4 class happened to compose tunes using the same pattern of crotchets and quavers, so the rhythms were the same but the notes different, creating nice harmonies! 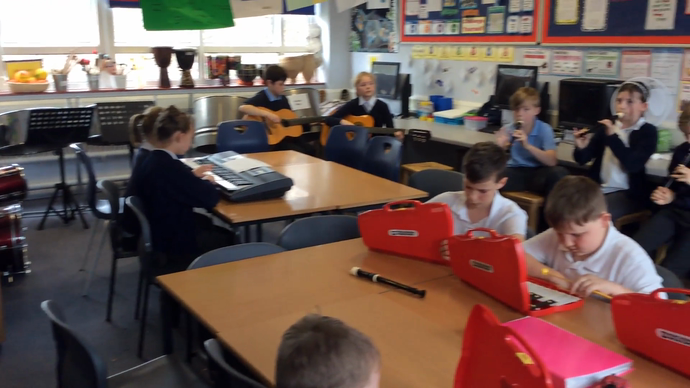 In their music lessons, Year 5 have been singing, playing instrument parts, improvising and composing to the rock song 'Don't Stop Believin' by Journey. They have practised more musical skills and are using more complex instrument parts, including minim notes. Year 5 worked in groups first of all to create 2 bar tunes using 4 minims. From there, they worked in pairs to try to make their compositions a bit more challenging by changing a minim to two crotchets, meaning that they were using 5 notes. They then performed their many different tunes together, in harmony and keeping in time well. 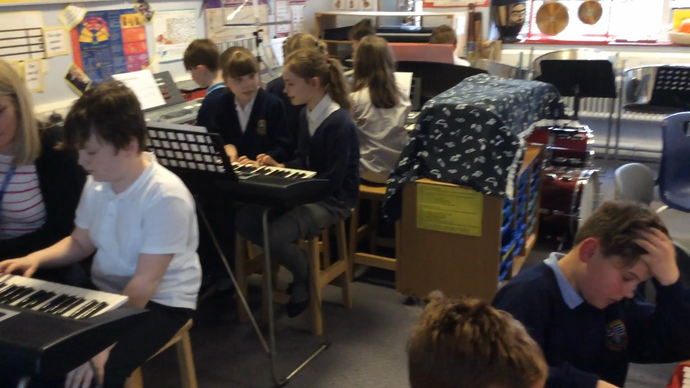 In their music lessons, Year 6 have been singing, playing instrument parts, improvising and composing to the rock song 'Livin' on a Prayer' by Bon Jovi. 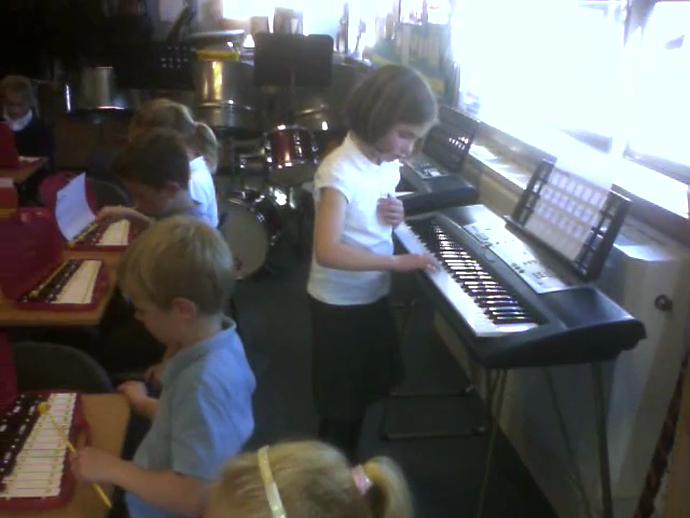 The children have managed to play instruments in harmony together in three different parts. They have used recorders, glockenspiels and keyboards. They have been using crotchet, minim and semibreve notes. In groups, Year 6 composed two 4 beat bars of melody using minims, crotchets, minim rests and crotchet rests, using up to 5 notes. They did this together on glockenspiels then some moved to different instruments if they could play their melody from memory. They had to work hard to be able to perform independently on their instruments while keeping together with their group. They then performed with one group starting at a time and continuing to build up the piece. They had to concentrate very hard to play their tunes in time with their group, and in time with the different tunes of the rest of the class. 6SP composed some complex tunes using crotchets, minims, quavers and rests. All groups produced very different rhythms, which were tricky to play together and keep in time. With lots of concentration in their groups and listening to the pulse of the music, they managed to do this. On Thursday 16th October, the Year 6 orchestra performed to Key Stage 2 their piece, 'The Skye Boat Song'. They had only been rehearsing for around 3 weeks! They played different parts on keyboards, piano, steel pans, recorders, xylophones and guitars. We have some very talented children! Mr Croombs from the East Riding Schools' Music Service gave us a drumkit demonstration! On Tuesday 30th September, Mr Croombs from the Schools' Music Service gave Key Stage 2 children a demonstration of how to play the drum kit. Some children even got to have a go themselves. It proved to be a very popular instrument with the children!